Stay tuned for upcoming events for Hua Kuch Yoon in near future. Hua Kuch Yoon, a satirical Theatre play will be staged from 15th February to 15th March 2018 at Karachi Arts Council in Karachi. It is being presented by KopyKats Productions. It is written by Sajid Hasan and is directed by Dawar Mehmood. It is prelude to Sarhay 14 August Say Pehlay. It is set against an Indo-Pak background. The play is running across the country for seven months. It began from Peshawar on 22nd November 2017. It then headed to multiple cities of Pakistan. It will finally conclude with a spell in Karachi. 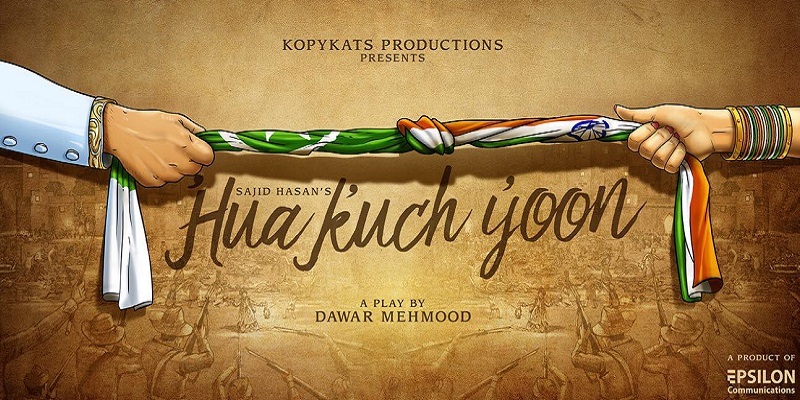 Hua Kuch Yoon is a fictitious account of two love stories, present day and past, depicting the trials and tribulations of lovers caught up in the revolutionary web, between Pakistan and India. With a humorous angle, it looks at how the lives of people can sometimes be effected by two warring countries. Mishal and Yasin find themselves dead but alive, after a fatal accident, in a strange place where all is possible, barring a few things. After discovering that they must marry to be together, they decide to tie the knot. However, two strange men, Bunta and Janta, advise them to not to get married. "Why? ", the lovers protest. In response, they are narrated the story of Qurat-ul-Ain and Raja Mahmood, two victims of Jallianwala Bagh, who survived, and their tragic love story. The play chronicles the events of partition and history, merging them in a wonderful journey of nostalgia that is bound to get tears into the eye. Best Viewed at 1024 x 768 pixels and above. This Page loaded in 0.07338 seconds on Tue, Apr 23, 2019 (21:27).